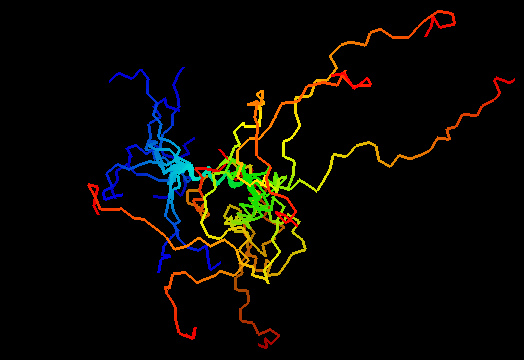 Just a part of an α-helix is ordered in NMR models. This should be a two-domain protein, possibly forming dimers, but NMR models were too poor to reveal the structure of a very sequence-conserved short C-terminal domain. This target should probably be removed and predictions not evaluated. Unknown, as the C-terminal domain was unstructured. Comparative modeling:easy. This is a joke, as many servers predicted the sinlge α-helix with 100% accuracy. This target should probably be removed and predictions not evaluated. Protein of unknown function (DUF1674) in Pfam. N-terminal sequence domain is a coiled-coil, C-terminal domain is very short, but very conserved, we term it WF-cage domain. Very insteresting protein. Can be a prototype for a large domain family, so its structure should be properly determined. First models for T0484: Gaussian kernel density estimation for GDT-TS scores of the first server models, plotted at various bandwidths (=standard deviations). The GDT-TS scores are shown as a spectrum along the horizontal axis: each bar represents first server model. The bars are colored green, gray and black for top 10, bottom 25% and the rest of servers. The family of curves with varying bandwidth is shown. Bandwidth varies from 0.3 to 8.2 GDT-TS % units with a step of 0.1, which corresponds to the color ramp from magenta through blue to cyan. Thicker curves: red, yellow-framed brown and black, correspond to bandwidths 1, 2 and 4 respectively.